Arrangement of small interiors frequently poses a greater challenge for a designer than work on huge spaces. Small rooms and consequently smaller windows harmonize well with delicate curtain rods with rods diameter of Ø16mm. They do not dominate the window arrangement, yet enhance its style in a subtle manner. 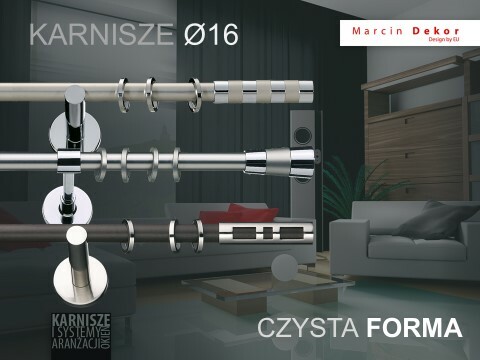 The collection includes both stylish curtain rods, popular floral patterns and clear forms contrasting impressively with modern models of curtain rods. All the curtain rods are available as elements on retail market, what allows the clients to compose their own individual curtain rods.